Hello, I made today's card for the Less is More challenge #327. 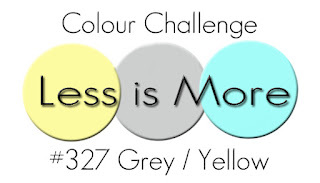 The challenge this week is to use the colours Grey and Yellow. I have used one of my newest stamp sets from the lovely Catherine Pooler designs called Beautiful You. I water coloured using Catherine's Tiara ink for the flowers and Memento London Fog ink for the leaves. You can check out the Less is More challenge blog here! And here is the Beautiful You stamp set I used. Beautiful card, Michelle! And beautifully watercoloured too. Always love your work. Thank you so much for joining us this week at LIM. Michelle this is a stunning card. Love your layout. This card is stunning. Love it! Thanks for sharing at Less is More! Congratulations on your win! Your card is beautiful!